Nu Skin is a direct selling company, well known for their cutting edge skin care products and lucrative income opportunity. Having established for more than 30 years in the beauty industry, it may seem like a good side business to venture into. But with all its glory, can you truly make money with Nu Skin? This article will prepare you with the harsh realities of dealing with network marketing. Nu Skin is founded in 1984 in Utah, US. The company offers consumers more than 200 premium products in the beauty and wellness category. They have markets in more than 50 international locations around the world through a network of more than 1 million distributors. To date, more than $12 billion dollars of sales compensation and incentives have been paid to distributors. From the very beginning, Nu Skin has identified and latched on a trend that they know will attract a lot of consumer’s attention, especially baby boomers. Their trademark product – AgeLoc – isn’t just another ordinary lotion, but it’s known to target the signs and sources of ageing at the genetic level. It’s almost like they hold the ‘secret recipe’ for making anti-aging concoction. Many endorsements have been stamped onto this product, from scientists to general users, making them look genuine and even more desirable. Needless to say, another reason that makes the company attractive is the fact that by selling these products to the masses, you get to earn sales commissions, team bonuses and eventually generate a stream of passive income at the highest level of the marketing distributorship. And this is the part that I want to talk about. Passive income is an overrated statement. In order to run a successful business – whether it is related to MLM or an online store – you need to put in a lot of effort so it’s best to know what to expect before you get involved. Let’s face it, anything that is backed by genetic studies is going to come with some heavy price tags. That is besides the fact that the prices also need to be marked up significantly for the company to pay distributors their commissions. 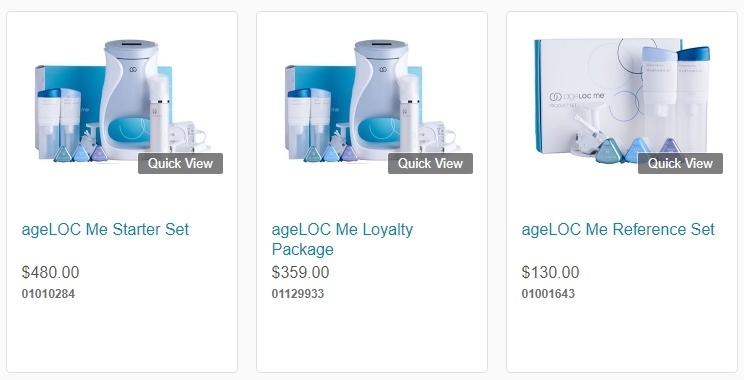 Take a look at the retail prices for the AgeLoc products. While this is good news for distributors, in most cases, you need to experience the products yourself first before promoting them to other people. Hence, buying a few of those products yourself is, at some point, inevitable. Of course, it’s not practical to own every single product on the catalog. So the question is, how much (recurring) inventory are you willing to invest in this pricey inventory and use diligently, even before you start making any money? How many people do you know who are interested in anti-aging products? I only know a handful. How many people do you think search for these products online everyday? I am sure a massive number of them, and that’s where our problem arise. People are accustomed to shopping online these days and they are likely to search along the lines of ‘anti-aging product that works’ prior to purchase. Google returns me 10 results for that phrase and NONE of them points to Nu Skin’s website or products. I also tried ‘best anti-aging products 2017’ but the brand name barely surface at all. Instead, they are all competitors to Nu Skin. That, my friend, is how you lose potential customers when there’s a lack of online marketing presence by the company. We know for a fact that our audience is there because the trend says so, but if you are going to rely on the conventional MLM approach – i.e. going through your contact list to arrange for product demonstrations – you’ll never come into contact with these people who are actually interested versus friends/families who are usually obligated buyers. However, Nu Skin deploys social media very well, at least in my area. You’ll always find events and product launch activities posted on their Facebook page and they grow their number of followers through this type of news feed. Honestly, it is all about creating a buzz to attract attention and brand awareness. You can’t actually sell anything unless the visitor is directed to their online store. Almost anything can be found on eBay these days because there are no strict guidelines for sellers. I discovered several MLM products on the listing before, Organo Gold coffee and Doterra essential oils, just to name a few. So, it’s not surprising to find Nu Skin products on eBay as well, selling for a cheaper price even after including the shipping fee. In this example, one can get two boxes of Galvanic Spa Facial Gels for about $86 instead of $94 when buying from the main store. That small $8 difference is what attracts retail customers and helps this seller make more than 100 units of sales. He/she and many others will be your competitors in the online market and there’s really nothing much you can do about it. Is Nu Skin going to do anything about this? We don’t know. But we do know that consumers will always source for cheaper alternatives and if it is made available to them, they will naturally buy from others instead of from you. Like many MLMs, Nu Skin has their own fair share of bad press that have compromised their reputation. In 2012, the company was asked by Stanford University to stop using a geneticist’ name, Stuart Kim, for AgeLoc’s product advertisements. It seems that the name is still being used even after the scientist stopped his collaboration with the company in 2011. Just last year in 2016, Nu Skin was accused of operating illegal pyramid-type of schemes in China and making misleading statements about their products to consumers. The incident has resulted in a $47 million dollar lawsuit settlement. In case you are wondering, most of the products aren’t approved by FDA for safety use. Yet, Nu Skin continues to make exaggerated claims about their products that prompted the authority to intervene with the possibility of conducting clinical trials to prove their efficacy. All these news can be found on the internet and they will certainly raise doubts among those who are consumer and business savvy. Now, let’s talk about their compensation plan, in layman’s term, how your distributorship earnings are calculated. Since going through the entire levels will blow your mind, I’m just going to explain the fundamentals here. There are generally 3 types of customers that you want to target for your Nu Skin business. Retail customers – earn up to 25% in commissions. Preferred customers – a member who uses the product, but isn’t a distributor. Distributors – a person who engages in the distribution of the company’s products (and also uses the products). Meanwhile, each product has their own point system that don’t actually correlate with the selling price. For example, an AgeLoc Me Starter Set sells for $480 and carries 350 point value while the AgeLoc Facial Gels sells for $43 but carries 32 point value. The accumulation of these points is then translated to your earning potential. In order to make money consistently from Nu Skin on a monthly basis, you need to become an active distributor. For that, you are required to achieve 200 volume points from the 3 types of customers that I mentioned in addition to 5 retail customers. That means, you will need to constantly find new customers AND RECRUIT new members/distributors every single month. If you considered all the facts that I’ve shared, the odds are going to go against you. You may find some success in the first few months, but once you run out of families/friends to approach, the hurdle is going to be very real. Despite producing some innovative products, I do find that they are highly priced compared to other anti-aging brands that are just as reputable and effective minus the cumbersome point system or membership recruitment. Their lack of online presence is an evidence that their forward vision isn’t really in line with the current marketing strategy. Hence, if you are still thinking whether you can make money with Nu Skin, I would advise to reconsider that plan. There are a lot of other brands that are more advanced and transparent in their approach to product selling and the good news is, most have affiliate programs that enable you to start an online business without needing high cost of investment. If you like to know more about affiliate marketing and how to do it successfully, you can check out my recommended training platform for more tools and resources to get started. Please do not hesitate to connect with me from the inside and I’ll personally walk you through the process. Question : Do you have any experience with Nu Skin or similar brands? What are your thoughts about selling skin care products as a business niche? Please share your comments in the space below. A very thorough analysis. I have never personally tried to sell any MLM products, but I sure have had people attempt to have me buy in. I think the biggest issue with any program like this is people fall for the sales pitch and assume they are going to get rich quick. Like any thing you have to put a lot of work into it, and most people don’t realize this until they have already bought the start up kit. Honestly, affiliate marketing is not only a much more reliable way to earn money online, but it eliminates dealing with the physical product. Keep spreading the good word. Very insightful analysis. The thing is – most people hardly take time to research on these MLM businesses before engaging in them. They just get carried away with the assumed promises and I believe that is what gives these companies the energy and courage to spin more deceit on people. I have fallen victim once and ever since sworn, never again. I have never been good at any MLM type company. I imagine that almost any MLM company would be just as hard to get going as Nu Skin. Plus with having such high priced products, you would probably have to know the right people that make the kind of money needed to spend on these products. I won a day cream from a different company that was originally around $90 and the cream didn’t even last me 3 weeks. The stuff worked like a dream! But I could never justify that kind of money! Hi there. Personally, I stay clear of MLM for the exact reasons that you mention in this article. The products are way over priced considering they need to be scientifically tested properly, and trying to keep up with making minimum monthly sales etc. just sounds exhausting. I would much rather spend my precious time building my own website and business from scratch on a fantastic platform like Wealthy Affiliate, where you get good training and lots of help along the way from a community of marketers. I had been a network marketer with a pharmaceutical company called BF Suma, an American based company for roughly 2 years, but the pricing of their products kept on increasing every after 4 months. Not forgetting the massive competition from the Chinese firms which are selling their products at a cheaper price. It was a drama but I learnt something from this company. I ended up choosing affiliate marketing and it’s something that I will never look back. Hi there Aslam, that’s the reality of eCommerce in any niche these days – that you’ll always face with cheaper alternatives in the Chinese market. Take a look at the AliExpress marketplace for example, the number of brand-less product varieties is just massive. But do they speak for quality? Not necessarily. That’s where I feel affiliate marketers/bloggers can fill the gap/concerns through publishing honest reviews for their niche so that their audience becomes more informed before purchasing a particular product online.